Thank you for all the concern you’ve expressed about Sprout, on- and off-line. After much deliberation (read: 10 minutes angst + 2 minutes discernment), we decided to try a live trap. I’m not in favour of traps – heart-filled or otherwise. However, as the weather deteriorated and my mental state kept pace to the tune of the wild winds, it seemed the only thing left to do. The first night we put the trap out filled with kitty kibble and a can of salmon mash. If Sprout showed up at all, we likely missed it in the out-of-sync periodic window checking. 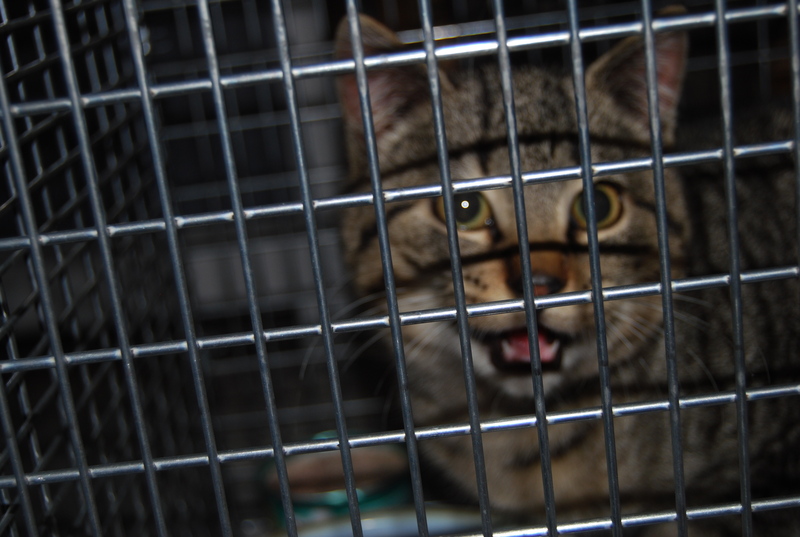 By bedtime, we had deliberated every contingency of leaving the trap out overnight versus taking it in. The advantage of leaving it out was that we might capture him – or something with four legs anyway. The disadvantage was that if it did trap him and we didn’t know it, he was left in the cold with no shelter. Bringing the trap in meant another day of cultivating distress tolerance. Besides we had no idea it was going to work anyway and my mind pulled in at the what-if gas station and filled its tank to overflowing. Yes. Pungent, oily, slimy small fry fish. We laced the kitty kibble with the stuff, slathered it on the cage wire, set the door (I wanted to put a blanket in it just in case he needed the comfort) and laid it out on the deck. No Sprout. Apparently the delightfully sunny day and the vast acreage of mice-filled fields were more appealling than store-bought sardines. However, by nightfall he slithered up to the deck like an adolescent past curfew hoping Mum and Dad were asleep and he could catch a snack without waking them. We sat at the kitchen table ready to pounce outdoors at the sound of the trap being sprung. I still had deep doubts about its safety which fed a firestorm of fears that he would be hurt in the process. After all, our good intentions had not done well for his mother and my brain now had this one-way neural path that anything I might do intending good would end up bad. Ah, Doubt. You insidious, entrapping, pungent creature. Get thee behind me! I used to think that doubt was counteracted by confidence. Now I sense that doubt is rousted by the willingness to take that risk we would anyway if not crippled by our need to always have a good outcome. 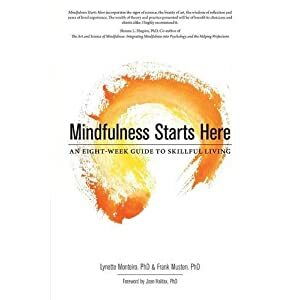 Furless, clawless, top-heavy creatures that we are, the common assumption is that we use our brains to compensate for our inability to risk in the same way a sabre-tooth tiger or polar bear would to survive. Perhaps not. Lumber we might but there was certainly a willingness to take the risk by going out to hunt or to turn and face the rampaging beast in order to protect our offspring. We are not risk averse because we are defenseless. We are defenseless because, in taking a risk, we fear what an unfavourable outcome might say about our competence. Meet Sprout. Five pounds and quite disdainful of the sardines. 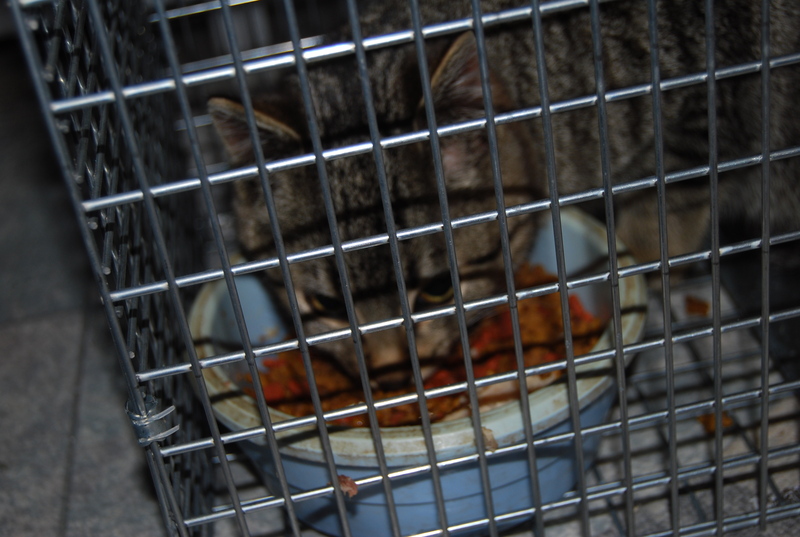 While in the trap, on the way to the vet, he delicately ate all the kibble around the fish. This entry was posted in 108 thoughts, reflections and tagged Heart Sutra, Hindrances. Bookmark the permalink. Hooray!!! Great doubt. Great faith. Great love. Great story! So glad Sprout is okay! And you too! Will have to say that your first post this week almost did me in… Prompted a mighty release in the shower. I can certainly relate to all the angst and mental gymnastics you have shared through your ordeal this week… and your wonderful insights about it all. Exceptional authenticity in the baring of your “soul”… Now that’s courage… Have a restful weekend! Thanks, Christine! It has been quite the journey, quite the coming to practice. ah Sprout, the incredibly cute great teacher! He is going to be an interesting teacher to follow over the next little while.